Team work is a well-meant concept that should lead to greater productivity and performance where we can leverage off each other’s ideas, experience and knowledge. However, this often turns into a nightmare to manage as well as participate in. Leaders spend their days micro-managing and mediating conflicted situations, which is draining on time, resources and efficiency. Productivity drops and the initial objective of, “many hands make light work” becomes heavy, emotionally exhausting and unfulfilling. Everybody loses in this scenario. Team building in the workplace can be a helpful solution to lift everybody’s spirits and get them on track to operate as a high-performing team. It’s a wonderful idea to kick-start a process, however it needs to be well planned and researched to ensure that it achieves the long-term results required. It also needs to be facilitated by an expert objective party. This is where 4Seeds can offer your organisation valuable input! The simpler element of the two, task work is about getting the work done to meet a predetermined team goal. Task work can be achieved collectively or sometimes independently of others. This is commonly not a challenge, whereas teamwork is by far the more intricate element. Teamwork is the main reason why individuals, teams and often organisations fail. It is made up of behaviours, attitudes and thinking styles, personalities, belief systems, values and soft skills. This is why this component is so tricky. Teamwork is the fundamental variable that differentiates a peak performing team from a dysfunctional one. A team that is not functioning well together can be felt and seen by people within and outside of the team. The energy feels uncomfortable, tense and heavy. Dysfunctional teams have a physical, psychological and emotional impact on the individuals involved and this impact will become apparent in their work engagement, commitment and performance. When you are looking at team building in the workplace, reflect on which of these components are present in your team. This will help you to choose a team building company in Johannesburg that will have the optimal results for your team. Research has shown that a team of up to twelve people is harmonious, effective and efficient. For some reason after that, every team member that joins changes the team dynamics. Little sub-cliques of three to four people form, and the language changes from US to THEM and the primary goal of why teams were formed is eradicated. The actual benefits of team work quickly turn into a costly affair for the individual, the team, the leader and the organisation. There are no winners when team dynamics become dysfunctional and there is no quick fix to the situation. 4Seeds customises team building interventions to meet the organisational and team needs. 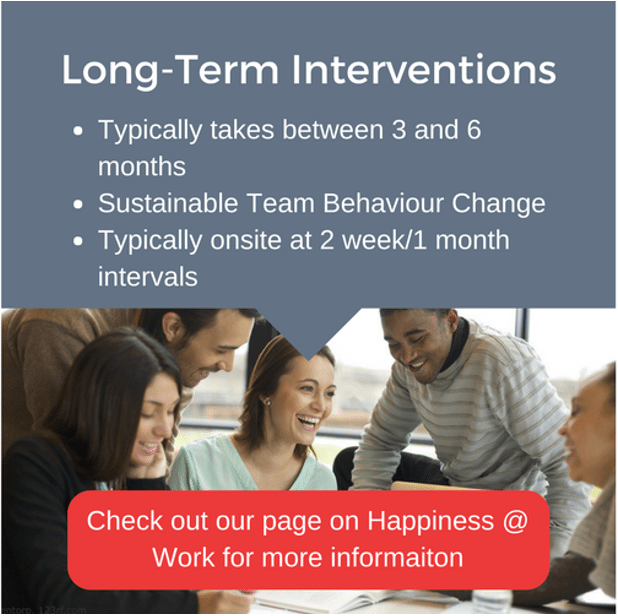 This bespoke approach ensures that team interventions are used exclusively to drive both individual and team change for your specific organisation. Identifying key areas of development will determine the structure and layout of the intervention and ensure it is relevant and on point. Activities are used to enable a team to learn, reflect and self-correct, leaving them with a powerful toolkit to use in the workplace. Our team building interventions are impactful, light and fun but with a serious undertone of learning and transformation. 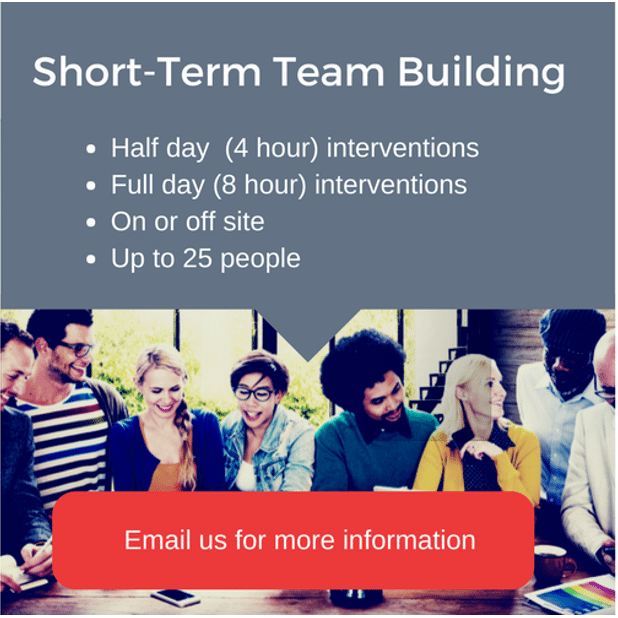 To be effective and efficient, team size does matter, and we recommend team interventions to be for up to 25 people. Any more than that, and we would suggest dividing the team into two separate groups. 4Seeds offers long-term and short-term, powerful team building interventions. For team building in the workplace to be impactful and successful, 4Seeds typically begins with meeting the senior leaders, that way ensuring that we receive their unequivocal support and guidance to address the root cause and not only the symptoms. Are you ready to take your team to the next level of thriving? Get in touch. Link to contact us page.